MIAMI (January 12, 2017) –Global architecture and design firm Stantec was selected by luxury multifamily real estate developer, ZOM, to spearhead the interior design of Met Square, the fourth and final phase of Downtown Miami’s Metropolitan Miami, the mixed-use residential complex located at 300 Biscayne Boulevard Way. “Our vision was to create a sophisticated, urban environment that brought together the project’s historical significance and its distinctive surroundings. Our team created a classic, elegant look that aligned with the design concept by blending natural quality materials, such as stone and wood, with modern sleek metal accents,” stated Susan LaFleur, director of hospitality and residential interiors at Stantec’s Miami office. 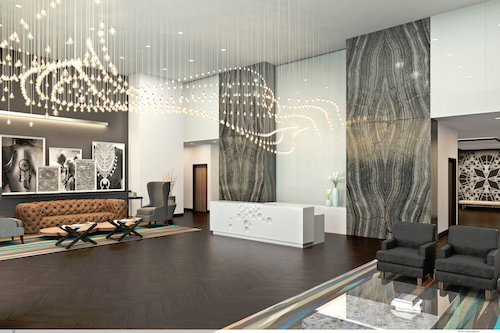 Tribal design touches can be found throughout the building’s elegant, expansive lobby. A stainless steel detailed marking on the wood flooring reflects the path of where the Miami River’s edge once flowed and leads to a fossil carving on the white marble reception desk. Adding to the décor is a striking undulating light fixture designed to cascade and guide tenants and visitors across to the reception area. Three-dimensional metal panels with tribal symbols and tribal jewelry will grace the lobby and serve as a reminder of the earlier settlers. On the 8th floor amenity deck, sliding glass doors will surround the clubroom and entertainment area creating an indoor/outdoor environment. Ground water features will lead to the pool area with cabanas, lounges, a gaming area and BBQ pods. A staircase with marble walls will connect the amenity deck to the wellness floor below with a spa and fitness center. Neutral color tones with bold black accents and natural materials will be implemented throughout the building, creating a stylish, raw setting. Features such as reclaimed wood, green wall, rubber flooring and low VOC paints, signal the project’s adherence to green elements. The prominent 714,000 square-foot, mixed-use project will feature 391 residences, a spa, club lounge, pool deck, four restaurants and an 18-screen multiplex with 1,778 seats. Met Square is expected to be completed in 2018. I agree with the others the “tribal pastiche” is very weak, in fact based on the image I see, the “tribal” flourishes are not even Tequesta in nature. The “dream catcher” as shown in one of the photographs in the lobby originates from the Ojibwe tribe which comes from the Wisconsin/Michigan/Canadian border area. But really dream catcher have become very generic as they are sold in virtually every Native American gift shop. The other images appear more south-western variety. The truth is that South Florida, specifically Miami, historically has been a very difficult place to live back then and difficult to reach. As a result not much is actually known about the Tequesta, not many artifacts survive, because it was a small tribe and a very hardscrabble existence. They did not produce the type of wealth needed to develop intricate artifacts. The Seminole / Miccosukee people are completely different from Tequesta. Be very skeptical when someone says anything about the Tequesta. That said it is a nice looking project from the image, but that Tribal Pastiche is just weak design statement, something they said on the first day of schematics and then never really followed through. You’re right about the Tequestas. Little is known about them because they left little behind and were mostly gone by the time the Spaniards arrived. They should go Miccosukee with the decor. Much more colorful and they too once had villages all along the Miami River. There is nothing tribal nor chic about this design. It’s as incongruous as the description. Tribal..? Just because there show some native art??? They have no idea what they are doing. They should take a look at what mexicans or peruvians have done by abstracting their heritage and project it into a modern scheme….total amatures!!!! They are not paying respect to the ‘little’ history we have….then we can’t complain when they say Miami has no character or individuality if we don’t exploit it. Why would people consider that furniture bought straight from any X furniture store and placed in a building lobby to be a work of an ‘interior designer’??? This is crappy work produced by an average Interior Decorator with its office seating on his garage at his Doral house….what a waiste of time and money to even make a rendering out of it….I would never pay for that. What’s wrong with Doral ? for god sake stop this foolish charade….tribal chic? ?…even sounds ridiculous….. When are they going to fix this situation ? Because the weather was causing the exposed limestone to weathering. While I disagree how they did it, protecting was also important. Was the building’s architecture changed, because from the renders it looks considerably better, especially with the “bow” feature and further consistent facades instead of the cheap mess Stantec likes. Concerning the interior design, mixing modernism with vernacular architecture of a primitive culture we know little about is a recipe for disaster. Also, most the Tequesta were killed off by the Seminoles long before William Brickell arrived in Miami. I would have liked something more akin to the Royal Palm Hotel. The Tequesta were not killed off by the Seminoles, they were transitioned, in missionary efforts, between Cuba and Miami. They were either killed off by disease, or by Spainards in mutual battles, over 300 years till 1770, when the last remaining Spanish Record of their existence was written. The last “known”, “Tequesta” people were sent to Cuba in 1770. “Tribal chic” just sounds like a disrespectful on so many levels attempt at propriety. Oh my God the PC Police is out in force today!!! Let’s tear down all of Coral Gables because we appropriated Mediterranean/Italian architecture! !